Hawaiian arts and crafts projects often include flowers and vibrant colors that work to create a Polynesian theme. Kids can make their own colorful flowers to make crafts that speak to the Hawaiian culture. Host a luau in your backyard so the kids can wear and enjoy their Hawaiian craft projects. Leis are a traditional part of Hawaiian culture. Kids can make floral leis from handmade flowers and yarn. One way to make flowers is to dip the edges of coffee filters into watered-down acrylic paint. The paper will absorb the liquid and create a ring of color around the rim. Punch a hole in the center of the coffee filter and string the colorful flowers onto a strand of yarn. Another way for kids to make paper flowers is to draw the outlines onto construction paper or craft paper. They can decorate the flowers with color and glitter before cutting out the designs and punching a hole in the center. Kids can also make flowers using colorful sheets of foam. Older kids may prefer stringing silk flowers onto a strand of thread or thin yarn using a needle to puncture through the flower’s center. Hawaiians who participate in luaus and other cultural events often wear floral headbands. Kids can make floral headbands by stringing a row of silk or paper flowers into a circle that fits around their forehead. Make the flowers for the headband using the same techniques as the flowers for the lei. Kids may enjoy making their own Hawaiian grass skirt using a roll of brown craft paper. Craft paper is heavy and available in standard 20- or 36-inch widths. Cut two sections of craft paper wide enough to fit around your child’s waist, plus 6 inches. To make the grass skirt green, paint one side with acrylics. Stack the paper and staple it together along the shortest side. The stapled edge is part of the waistband for the skirt. Cut the paper into fringe strips to resemble blades of grass. To cover the staples, glue another strip of paper over the stapled band. Self adhesive interlocking strips will work as a closure for the grass skirt. 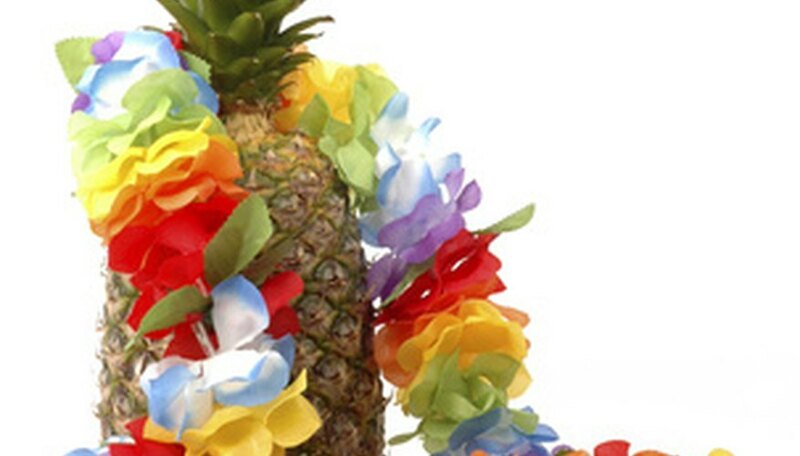 Make a decorative luau windsock using craft foam and vinyl streamers. Glue four 16-inch long strips of vinyl streamer material along the short edge of a sheet of craft foam. When you roll the foam into a tube to make the wind sock, the streamers will hang from the inside of the tube. Craft glue, metal fasteners or staples work to secure the foam tube together. You can make a hanger for the wind sock using a pipe cleaner or fishing line. Kids can decorate the windsock with colorful flowers cut from more craft foam or silk flower that resemble tropical Hawaiian blooms.